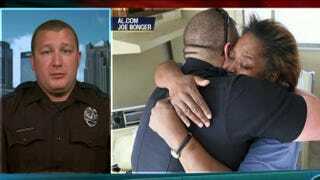 Police Officer William Stacy (in left frame, and right, being hugged by Helen Johnson). Stacy let Johnson go after she was caught stealing eggs to feed her family. On Dec. 6, Tarrant, Ala., police Officer William Stacy got a shoplifting call from Dollar General. Stacy gets such calls all the time. When he got to the store, he was shocked by what he saw: Helen Johnson, 47, was short the money she needed to get a carton of eggs, so she had stuffed a few in her pocket and they had cracked as she began to walk out. "Usually people are stealing things like makeup or phone chargers—not things they need to get by," Stacy told Yahoo Parenting. Johnson told Stacy what she had done and why she had done it. At home were her "two daughters, her niece and two young grandkids," who hadn't eaten since the Thursday before. "When she mentioned the kids and said they were hungry, that's when I knew I wanted to buy the eggs," Stacy, 23, told Yahoo Parenting. "No matter what financial situation kids are in, it's not their fault they're hungry." So Stacy paid the $1.75 plus tax for the eggs and gave them to Johnson with a promise that she never try to steal again. Stacy's kind act was caught on video and quickly went viral. According to Yahoo Parenting, the video has been "viewed more than 966,000 times and has received more than 22,000 likes. It has been shared nearly 13,000 times." The kindness didn't end there: People across the country who saw the video sent donations for Johnson to the Tarrant Police Department. "It took an entire shift to take all the stuff to her house and unload it," Stacy told Yahoo Parenting. "I've taken three Tahoe-loads of food to her house, and I know a food bank came to bring her food, and they also got a Christmas tree donated." Stacy told the news site that the Police Department has used this as an opportunity "to start a fund to help feed the community as a whole." Facebook commenters have called Stacy an "angel" for his act of kindness, but Stacy just believes he is doing his job. "There's a real trust issue between law enforcement and citizens right now, but hopefully this shows we are not robots who just want to arrest people," Stacy told the news site. "We have hearts—you have to have a big heart and clear conscience of mind to do this job." Read more at Yahoo Parenting.